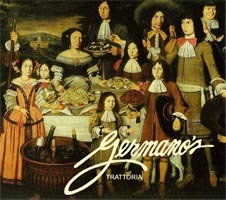 How was your dining experience at Germano's? Do you have a favorite dish? Maybe something could have been better? Well then please let us know! Fill out the form below and send us your comments, questions and suggestions. All information is optional and will be kept completely private. If you would like a reply from us, please give us your name and e-mail address. two words: bongo bongo. or is that one word? not really sure, but outstandingly delicious nonetheless! For the sixth year straight our trip to Baltimore has been highlighted by the dinner at Germanos. The salmon was perfect. The service is (and has always been) 5 star. Isaac is a master of hospitality. See ya next trip! Wonderful atmosphere and people. The food is great, and the music, The Waves, also great. Love the place. 3rd Cabaret at Germanos, entertainment is excellent , food is excellent, service is excellent!!! Nice evening. We ate at your restaurant at the end of January, Ignacio was our waiter, the food was excellent as was the service! We love Ignacio! We will be back!! I was in Baltimore for a work convention and the hotel recommended Germano's. There was a wait out the door but I will say that the bar, and bartender make the time pass by very quickly. My friend and I had delicious martini's at the bar before dinner, and returned after for a bottle of wine. The food is above average Italian food, but the bar is what makes the restaurant. If anything, when I'm back in town I will need to stop in for a drink. My husband and I had dinner outside which was excellent. Our waiter was truly a sweet heart. As I was going to the bathroom I stumbled upon the gorgeous bar. Bartender was extremely friendly and recommended great dessert drinks. Overall, amazing experience and we will be returning. We were only in the city for 2 nights and chose to eat at your restaurant and it was wonderful!! My daughter and her family just moved to Baltimore and I will definitely come back whenever I am in town visiting! Our waiter, Issac was exceptional! One can see that he has had the proper training that waiter's received many years ago. It's all of the "little things" that truely count! Keep up the good work. We plan to come in for Cabaret night very soon; and of course we will request Issac. We celebrated my friend's birthday last Saturaday night. We picked Germano's because we had been there before and the food, atmosphere and staff were excellent. this time we enjoyed an even better experience beause we had the pleasure of being served by Isaac. He was very professional and attentive. We enjoyed his humor. We had a very delightful evening. I plan to tell my friends not to miss the opportunity to go to Germano's. I hope you recognize Isaac for all his effort to make our evening so special. I have tried other restaurants in Little Italy and Germano's is truly the best! Thank you for making my experience in Baltimore one to remember! We thoroughly enjoy our visits every time we eat at Germano's. The food is great; the service is wonderful; and the owner is a true professional. The website is very impressive! !